1) Support the configuration of multiple mail sending accounts. 2) Support custom mail sending template. 3) Mail content support forms, pictures, multiple attachments, system variables and other formats. 4) Automatically remove the duplicate email address. 5) Choose the number of threads, control send speed manually. 6) Support exporting mail list to txt, csv, xls and other formats, you can freely choose to export the column, such as export only email, or the corresponding Status is also exported together. 7) Support exporting according to different states, such as export email address of successful send. 8) The use of advanced software architecture, e-mail sent is very fast. 9) The same serial number can open multiple software instances on the same computer. I am the CEO of a Machinery Import company, Antsoft Email Sender is recommended by my friend. After I use it a few times, I can not work without it. It is Easy to operate and configure mail templates. I just need a few steps to send a large number of e-mail. Our company will do a new and old customers care e-mail every month, I just need to import customer mailing list to Antsoft Email Sender, select the monthly e-mail template and send out just fine! I was looking for a software that could support bulk email sending. 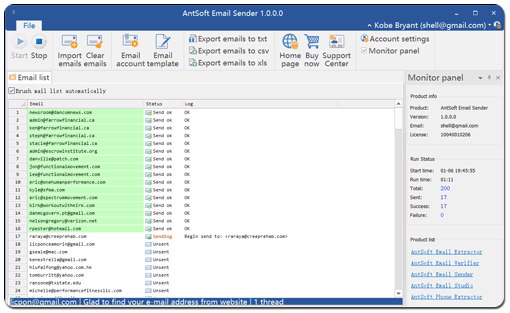 Fortunately, I met AntSoft Email Sender, a mail sending software that I love deeply with humanized operation process and beautiful interface.